JR Ultimate Petit Corona is dressed in a dark Connecticut Broadleaf wrapper that is as oily as they come. This thin, award-winning smoke will engulf your palate with bold flavors of earth, leather, tangy spice, espresso, and chocolate. Perfect with a nice “Cup-o-Joe”, or after a light lunch, these robust cigars are sold in aromatic cedar boxes of 25. Buy 2 boxes, get $10.00 Off! First smoked this cigar back in the 90's. With a 1 day special plus a 15% coupon I found online, I got a box for less than $50. It is very hard to find a well constructed stick with a tasty medium - full body in this size at a decent price. These fill the bill, especially at the price I paid. 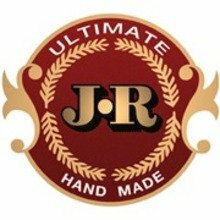 I have smoked many of the JR Ultimates over the years, always a favorite in taste and construction. The knock on smaller RG cigars has always been that you taste more of the wrapper than the blend. If that is the case with this cigar, it is only marginally so when compared with a #1, say, in the same wrapper. No construction issues at all, ever, and I have smoked 100's of them. Priced competitively with the Montecristo half corona and 444, which I like, but I prefer the Ultimate flavor as a regular smoke. If you have budget issues, which I do, watch for promos on these and the Monte's and pull the trigger when you find them on a blowout. But they are worth every penny at full price in today's market, as far as I can tell. Really an enjoyable 45 minute smoke. Flavor 'power house! A lot of flavor packed into a petit corona, equal to larger ringed cigar! Love the cedar box & naked cigars, I think it helps the aging process. I'll buy these on sale until 'the cows come home!" Must have been in the cedar box too long? The cedar finish doesn't quite finish for some time. Otherwise I like it. Nice burn and aroma, stays cool. J&R makes the best quality cigars for the money. This petite corona offering is a wonderful smoke enjoyed with your favourite beverage. Even coffee goes good with this cigar. I personally enjoy them with a glass of wine or spirits. Being a small cigar makes it easy to enjoy when you only have about a half an hour to spend. The flavours are robust yet never harsh...right to the end. I take the ring off and smoke it until my lips are burning...that's how good this cigar is..